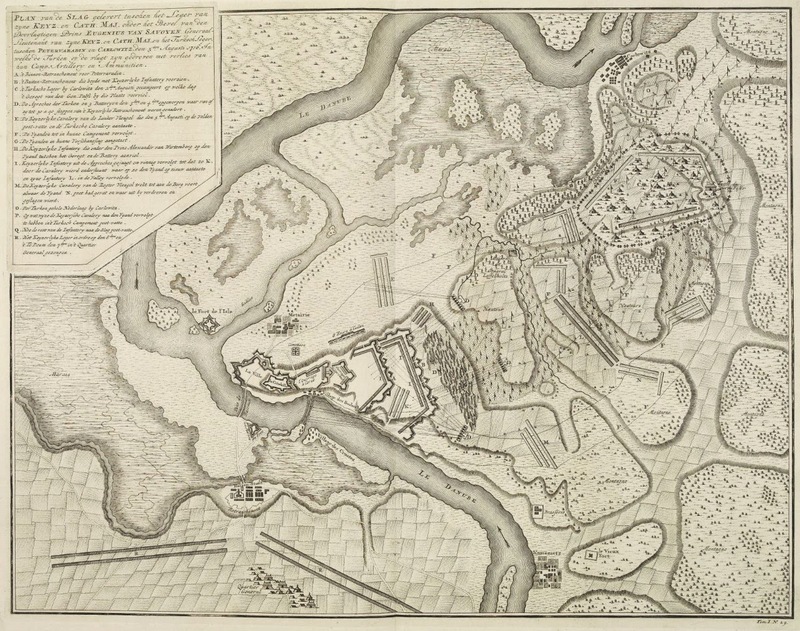 Uncommon engraving showing the Battle of Petrovaradin or Battle of Peterwardein, which was a decisive victory for Austrian forces in the war between Austria and the Ottoman Empire (1716–1718). 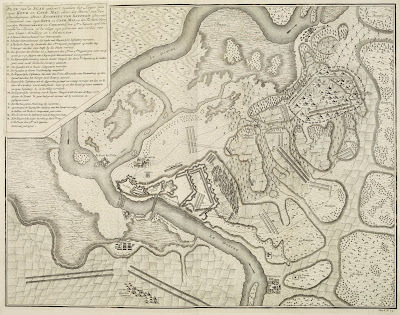 This battle took place at Petrovaradin at August 5th, 1716, which is now part of Novi Sad, Vojvodina, in Serbia. The lettered key (A-R) is printed in the upper lefty corner and is printed with from separate copper plate. Having defeated the Russians, the Ottoman war party pushed to engage Venice and recover Morea, a part of modern Greece. War was declared on December 8, 1714. Morea was taken with little effort, but this Ottoman success provoked Austria to renew its alliance with Venice and demand full Ottoman withdrawal from their latest conquests. Thinking themselves strong enough to deal with the Hapsburgs and reconquer Hungary, the Ottomans expanded the war to new frontiers and quickly encountered new disasters. 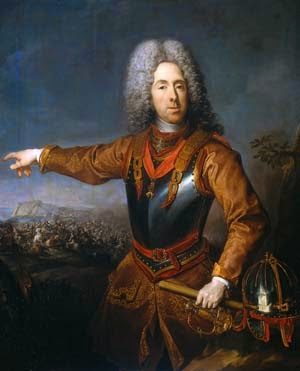 The grand vizier, leading 100,000 men, was attacked and routed by Eugene of Savoy at Peterwardein on August 5, 1715. Serbia was opened up to Austrian invasion. The year 1717 saw one disaster after another, with the Austrians occupying Belgrade in August, and while doing so capturing all the Ottoman artillery and ammunition, plus thousands of prisoners. Meanwhile, the Venetians, supported by the pope and the Knights of Malta, attacked the Ottoman rear, capturing Preveze and landing troops in Dalmatia. The only Ottoman successes were a naval engagement off Cape Matapan in July 1717 and the defeat of a Venetian effort to recapture Morea. A disastrous peace was signed in 1718, and the early promise of Ahmet’s reign ended in catastrophe. Peace was restored on the northwest frontier, but in the east wars continued. A few years of peace in the west ensued, but in the 1720s, Ottoman armies were fairly constantly engaged suppressing rebellion and religious strife in Iraq and Persia. In 1736 a new war broke out, as both Austria and Russia combined to strike the tottering Turkish Empire. The Russian goal was to make the Black Sea into a Russian lake by occupying the Crimea and mouths of the major rivers that emptied into the Black Sea and by destroying the Tartars, who had caused much damage to the southern Russian provinces. The Austrians wanted to keep pushing to extend their frontiers farther to the south. The Ottoman Empire faced both the Austrians and Russians simultaneously. The Ottomans, caught by surprise, actually staved off first the Russian and then the Austrian advance, inflicting several sharp defeats on both. This was too much for the Hapsburgs, who sued for peace in September 1739. Russia quickly followed suit, accepting French mediation. This victory was to prove a short-term blessing for the Empire, for in 1768 the same two powers again advanced against the weary Turks. This time, the improved Russian and Austrian forces were too powerful. The Crimean Peninsula was swept clean of Ottoman influence and the Austrians finally acquired complete control of the Balkans, laying open the possibility of an advance on Istanbul itself. All that saved the sultan was a combination of circumstances—Pugachev’s rebellion diverted the Russians, and Prussia applied pressure to both European powers to limit their conquests. Peace was signed in 1774, but vast lands had fallen to Russia, and the vital approaches to the capital were now in Austrian hands. This crushing defeat was followed in 1787, when the two European powers again helped themselves to slices of Ottoman territory. This might have been the end of the ancient, and by now decrepit Empire. Salvation for the last of the ancient autocrats came in the unlikely form of the French Revolution, and by 1792 the Europeans were too focused on their own problems to interfere in the south. More disasters and few bright days would follow, but the revolutionary fever in Europe bought the Empire another 100 years of existence.